No trip to Cambodia should miss Angkor. It’s full of history, mythology, stories of demons, angels, gods, and – of course -incredible architecture that survived the centuries – with some significant scars. 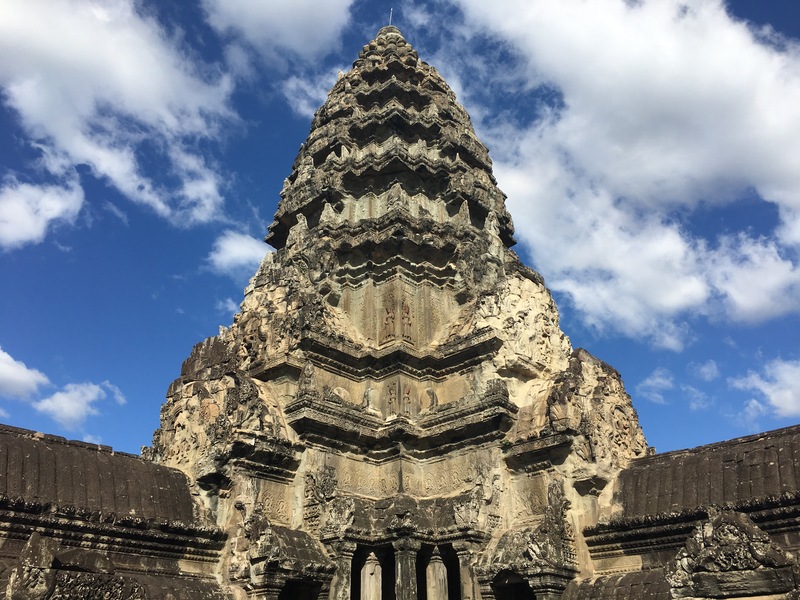 We spent two fascinating days there, immersed in myths of Vishnu, Shiva, Rama, and Buddha, and learned how Hinduism and Buddhism took their turns and their toll on the temples of Angkor. Our tour guide Yim speaks fluent German and knows every corner of Angkor inside out. He’s been touring the old city for over 15 years and has vital inside knowledge not only about the history but also about avoiding the masses of tourists and getting the best spots for pictures. Thank you, Jan, for putting us in contact with Yim- it was great to have him, he really upgraded the experience by 100%! 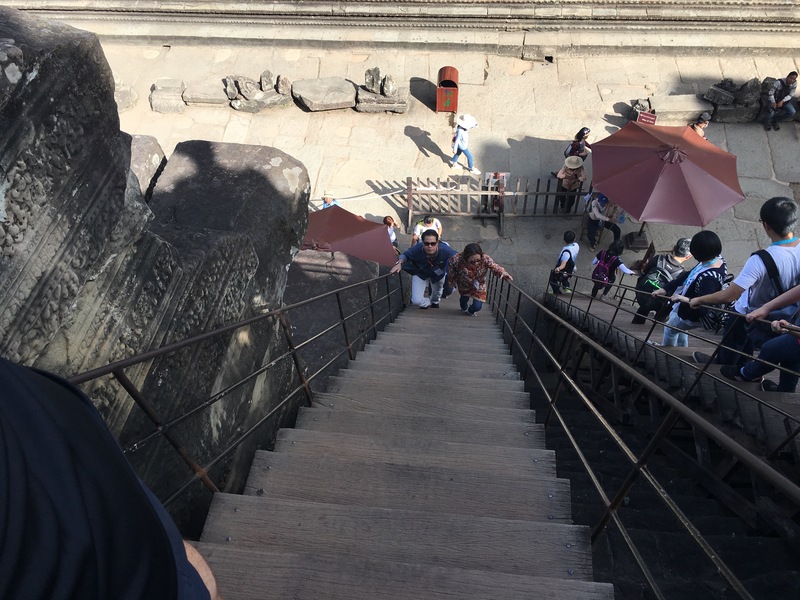 We started with Angkor Thom, the last Khmer capital, which dates back to the 12th century and was built by King Jayavarman the 7th (as were many of the temples we saw during or tour – he was quite busy this king). The bridge leading to the south entrance is studded with statues on both sides. The left side depicts valiant soldiers, who fought for the safety and preservation of the temple. The right side is for the demons and evil spirits threatening the city. Unfortunately, many of the statues fell prey to thieves, who decapitated them and sold the heads. Some of the heads have been replaced with replicas, some were restored and some will never find their way back. And so, the soldiers and demons form an unusual queue towards the gate. We walked through the south gate and learned that Angkor Thom has 5 gates in total: one for each cardinal point and an additional one between the east and north gate symbolising victory. The temple at the center of Angkor Thom is called the Bayon and is characterized by smiling faces carved into the towers. Like all temples in Angkor, this one also had to be rescued from under heavy vegetation. The entire area was forgotten for about 400 years and the jungle took it back during that time. Moss and massive tree roots made their way through and under the walls causing them to break and crack and crumble. We left Bayon passing two ponds that served as the ladies and gents baths respectively. Yim told us that King Jayavarman the 7th was a ladies man, so he had a large bath set up for his many wives and concubines, and just a small one for the men. He avoided competition by keeping only few men around. Some things don’t change across centuries. Next stop was the Terrace of the Elephants, which was used for big events like welcoming the victorious army returning from battle. After a relaxing lunch, we continued our tour with the Banteay Kdei temple, also referred to as the Jungle Temple. It got its alias due to the overwhelming vegetation that enveloped it during the centuries of abandonment and that, to this day, is present in every corner and crevice of the walls. Well, not really just in the corners and crevices. It’s more like the jungle decided to reconquer the temple grounds and gradually crawled all over. It’s mesmerizing and creepy. By the way, this is where they filmed Tomb Raider in 2001. This was the last temple of the day. Yim gave us a lot of stories and anecdotes along the way, most of which I can’t remember because I’m writing this many days later, after having seen so many other things, and my memory doesn’t serve me right anymore anyways. Andreas keeps mentioning Alzheimer’s, not sure why. Anyhow, among the few things I recall is that some of the temples are under the tutelage of certain European countries – meaning that they are being maintained and restored with funds from say France, Switzerland or Germany. It seems, though, that experts in these countries do not agree on the methods or materials for restauration, so each temple is patched and fixed in its own way. Also, materials come in fashion only to be discarded by the next generation of experts. Concrete was popular with the French experts in the 1970s, but is now regarded as a huge error in judgement. Sandstone is preferred today (incidentally this is the original material that most of the temples are built from), but it’s brittle…It looks like there isn’t a best approach and everybody is just trying their best. And with that we ended the day. And the year for that matter. We had a quiet dinner at the hotel and called it a night right after the madness of fireworks and what sounded like gunshots, but I am sure were just firecrackers, outside had begun. 2016 was a weird year in so many ways, but for us it´s the year we began this wonderful journey – so we can´t really be mad at it. Happy New Year! After the cloudy start we had at Angkor Thom, this day looked very promising with clear skies and bright sunlight. 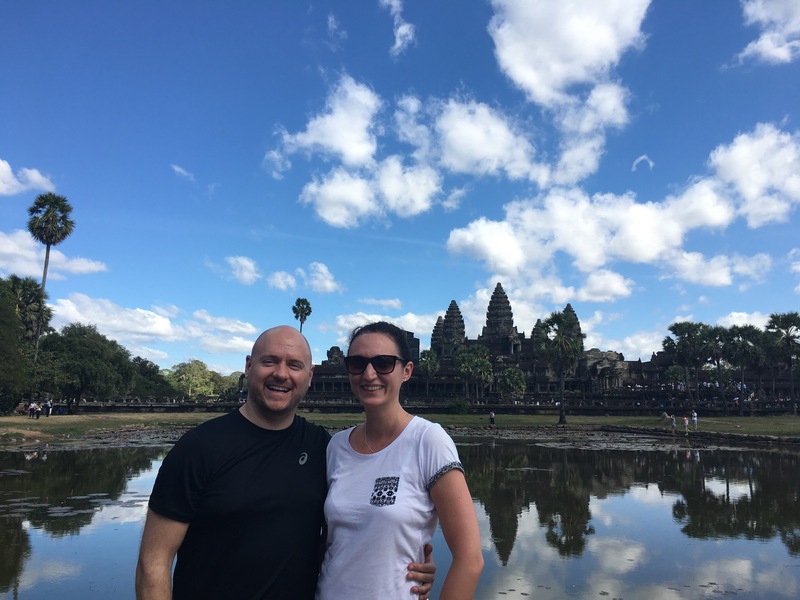 We headed back to Angkor to see Banteay Srei (Yim’s favorite temple and also referred to as the City of Women) and later Angkor Wat. While the temples we saw the previous day all depict either people or animals, Banteay Srei is filled with mythical figures and is dedicated to the Hindu god Shiva. The temple is very small – the smallest of all we have seen – but we could have spent a lot more time exploring the intricate carvings, decorations and statues. The temple is also called the Temple of Beauty. After having soaked up so much beauty, we had to get some refreshments. On our way to lunch, we passed by a village and observed how palm sugar is made. Yim told us that, in Cambodia, women are in charge of business and of the money. Most of the merchants in the markets are female: young girls aged 8 or 9, teenagers, young mothers with babies in their arms, middle-aged women and grandmas. Men work the fields, women take care of business. After a lunch of fried rice, papaya salad, and a coffee, we were ready for the highlight: Angkor Wat. Angkor Wat is the largest temple, built for the Hindu god Vishnu. Among many other things it is home to an array of basoreliefs. These intricate carvings depict mythical wars, love stories, the 37 heavens and 32 hells of Hinduism across endless walls of the outer galleries surrounding the temple. Most of the color has gone from the walls, but in some areas you can still see remnants of bright red. The inside is made out of several towers – some of which can only be reached by climbing a steep flight of stairs (only 100 visitors are allowed up there at any given time but I noticed that they’re not so strict with the numbers). The view from the top across the citadel is beautiful, but the real gems lie inside. The towers, bathed in sunlight and shadows, seem otherworldly. It’s not surprising that this is the most popular temple at Angkor. According to some experts – and also Wikipedia – this is the largest religious monument worldwide. It is spectacular in its magnitude and diversity, but also for the attention to detail, the ingenious architecture and the countless legends it holds. The ancient walls of Angkor Wat marked the end of our tour. We said good bye to Yim and returned to our hotel to get ready for the next day: 6 hours on the bus to Phnom Penh.